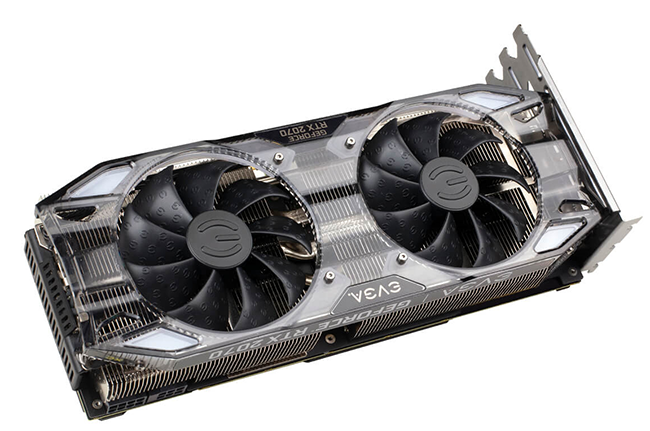 Nvidia added a third string to the all-new Turing bow by releasing the GeForce RTX 2070 last week. Though hardly cheap, this third-rung card brings in a lot of new-technology goodness at a starting price of £459. And that outlay buys you, by our reckoning, silky-smooth performance at QHD and a passable gaming experience at UHD. In fact, performance sits between GTX 1080 and GTX 1080 Ti, so the focus is on users who upgrade from older systems. The good news is that a number of Nvidia's add-in board partners are adhering to the $499 (£459) asking fee for basic models, though of course their blingier cards do attract considerable price premiums. A good case in point is EVGA. Offering five models whose price escalates from $499 through to $629, each is differentiated by either features or core frequency. The base model, 08G-P4-1071-KR, better known as the RTX 2070 Black Gaming, keeps to Nvidia's 1,620MHz boost clock. Going for the next model up, the RTX 2070 XC Black Gaming (08G-P4-2173-KR), costing $529, and keeps the same frequencies but adds in RGB lighting and ups the power input to 8+6-pin. The third model, RTX 2070 XC Gaming (08G-P4-2172-KR), costing $549, is exactly the same as the XC Gaming apart from raising the boost clock to a guaranteed 1,710MHz. All three share the same dimensions of 269.2mm long, 114.3mm high, and occupy a strict two-slot form factor. Things become a tad more interesting once you consider the RTX 2070 XC Ultra Gaming (08G-P4-2173-KR). Costing $569 right now, it boosts the core speed to 1,725MHz and, most notably, uses a beefier cooler that takes up 2.75 slots. You will have previously seen it on the RTX 2080 version. Though thicker, length and height remain the same as the aforementioned trio. Finally, at the top of the pile is the RTX 2070 FTW3 Ultra Gaming that attracts a $629 fee. For that you get a completely custom board measuring 302mm x 139mm and it too takes up 2.75 slots. Offering an 1,815MHz boost clock and dual BIOSes, it is clearly the best of the bunch, though pricing will remain a concern. All of EVGA's RTX 2070 cards run with memory at a stock 14Gbps. We mention all this because today's review focusses on two of these five cards. We have the $499 base model, RTX 2070 Black Gaming, and the mid-spec RTX 2070 XC Ultra Gaming. Let's take the latter first. Just like the RTX 2080 version, EVGA's board looks and feels premium for an AIB card. 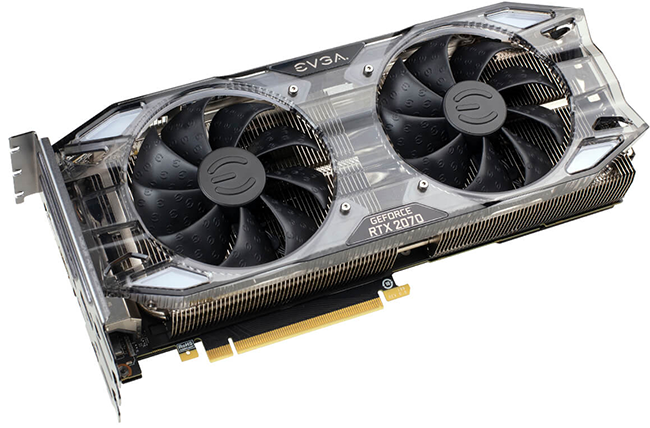 The transparent shroud adds a touch of class while the four corner sections can be changed to either red or black trims by registering your card with EVGA and getting them for free while stocks last. We know it works because the cooler is exactly the same as the one used on the more-powerful sibling. Having a 2.75-slot form factor enables EVGA to use a taller heatsink-and-fan assembly than on the dual-slot models. We have already observed that the cooling is overkill for the 210W RTX 2080, so it will cool the 175W RTX 2070 with even more economy. Expect a near-silent card that keeps GPU temperatures the right side of 70°C. It's worth knowing that the aluminium fins run about 80 per cent along the way of the PCB. The two heatsink sections are connected via six heatpipes - the central quartet are flattened - and the whole assembly sits on top of a near-PCB-wide plate that is in direct contact with the VRMs and memory chips underneath. The design is robust and the twin fans switch off at temperatures below 55°C. The entire card's name is backlit with RGB LEDs controllable by a subsection in the EVGA Precision X1 software. You can alter the colour, obviously, but also control the LED brightness and, if using the breathing mode, define the speed of change. The effect, in our opinion, is not as nice as the green on the Founders Edition card, and we would have liked EVGA to also give the fans the RGB treatment. If you are going down that RGB path, why not go all in? The marginal core overclock gives rise to 8+6-pin power connectors. Are they strictly necessary? Nope, though we see no problem with them when the cooling is solid. You ought to be able to increase the voltage without worrying about whether the heatsink can handle the load. 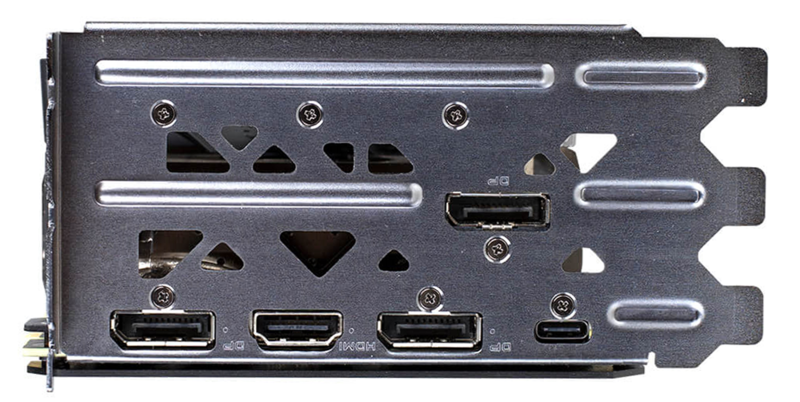 What you don't see is that EVGA continues to use a card-wide rear backplate for extra help when the GPU and memory are under long-term load. We know it works because, after 20 minutes of load, the rear heatsink was at 66°C, evaluated by an infra-red gun. It's therefore prudent to have good airflow running across the card. Going big on height requires a three-slot I/O section that looks ungainly. What you'll notice is that the five outputs are all in the same position as the original card, which makes sense, so the upper segment is largely wasted. As usual, the card is backed by EVGA's three-year warranty. We reckon that most of the card is good. It could be improved by enhancing the RGB lighting, and we wonder if a triple-slot design is really necessary on a mid-spec card. Another wrinkle, at least on this side of the pond, is the price, which at £550 is a whopping £90 dearer than the Black Gaming.